Stacking pavers to edge a garden or walkway adds definition and style to your landscape. Pavers are a durable material that creates an attractive, uniform look to contrast the colors and textures of plants. Stacked pavers retain soil in raised flower beds and prevent grass from encroaching. Use interlocking pavers if you plan to stack more than three levels to ensure the wall's strength and stability. Use a hose or flour to outline the area where you plan to stack pavers. 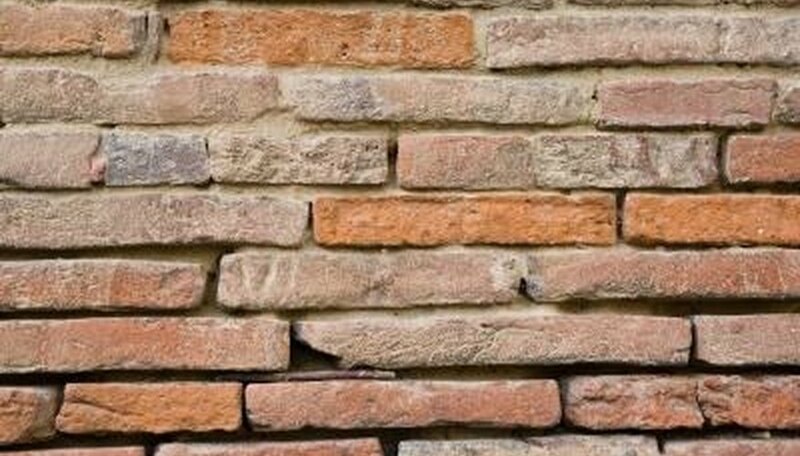 If you're building a garden wall, for example, the width of the wall will be the length of the pavers you are using plus 6 inches. Dig out the grass and soil with a spade or flat shovel. Continue digging until the surface is deep enough to submerge the first row of pavers, plus 5 inches. If you live in a cold climate, consider digging below the frost line to prevent frost heave damage. Compact the surface with a compactor machine or tamping tool until it is even. Pour a 4-inch layer of gravel over the surface and compress the gravel to improve drainage and prevent the foundation from shifting. Place landscape fabric over the gravel to inhibit weeds, and pour a 1-inch layer of sand over the fabric. Lay the first course or row of pavers, aligning the connection arrows with the interlocking joints or pressing them snug as you go. Tap the pavers with a rubber mallet to press them firmly into the sand. Backfill any gaps between the pavers and the soil with gravel. Place the second course of pavers with half bricks on the ends. The half bricks will offset the pattern of the pavers so that each paver overlaps interlocking joints beneath it. This laced look adds stability to the wall. You can either purchase half pavers for this purpose or cut pavers in half with a hammer and brick chisel. Continue to stack courses of interlocking pavers until you reach the desired height of your wall. If the wall is intended to retain soil, lean the stack 1 inch for every foot of height for extra stability. Lay capstones as the final course of your wall pavers to protect porous pavers from frost or water damage.